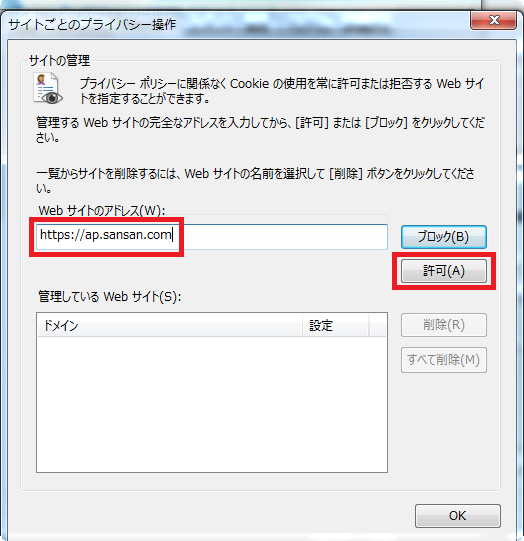 It is necessary to change the privacy settings inside the IE security settings. If you do not perform this setting and try to access Sansan from Salesforce, in some cases you will not be able to access Sansan because of the IE security settings. You have either timed out or you are not logged in. Please log in again. You may be using multiple windows or tabs and logging in at the same time. You can only log in from one window at a time. If you are not using multiple windows, please relog in from the link below. If both of the following conditions are met, this error will occur. 1. You are using Internet Explorer (this does not happen when you use Chrome). 2. You are linking Sansan to Salesforce. 1）1. 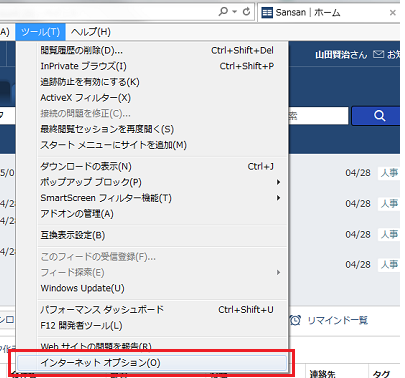 From Internet Explorer, log in to Sansan, and then from the menu bar, click on "Tools" and then on "Internet Options". If the menu bar does not appear, press the ALT key. 2. From "Internet options", choose "Privacy". See if the Internet zone setting is "Medium". After you have finished the Internet zone settings, click on the "Site" button. 3. Setting "Per site privacy actions"
In the field for website addresses, input the following URL, and then click on the "Allow" button. 4. In "Managed websites", check to see if the domain sansan.com has been added as "Always allow", and the press "OK".